Unlike some creatures of ancient Slavic demonology, like vampires and strigoi, which went on to earn a good deal of worldwide notoriety and even became part of popular culture, Slavic mythology remains to a large extent a terra incognita. But the awe-inspiring names of Perun, Veles, Svantevit, and Triglav testify to a much larger (if also largely forgotten) realm of Slavic myth and religion. Unfortunately our pagan ancestors left almost no traces of their religion, rituals, and myths. We have no surviving testimonies of Slavic prayers or myths, little iconography and hardly any artefacts – and certainly no spectacular archaeological finds, like the ruins of ancient Slavic temples. In fact, much of what we know about Slavic religion comes from Christian chroniclers writing their accounts at a time when Slavic religion was already in decline. All of this doesn't mean that our knowledge about Slavic religion amounts to nothing. For historians of Slavic religions, this lack of source material was a challenge – a call to resort to other methods and reconstruction, like drawing on the finds of other disciplines, such as linguistics, ethnology, archeology, comparative religion, and Indo-European studies, as well as searching for surviving relics of the ancient pagan religion still present in the tales, legends, and customs of the Slavic folk. Their results can often be called sensational. While it’s not certain if the Slavic religion had an organized pantheon of gods comparable to other Indo-European peoples like the Greeks, Romans or Scandinavians, Slavs surely had their deities. While many of them can reflect a more ancient shared Indo-European past, it remains disputable whether these gods were worshipped on the whole vast expanses of Slavic Europe (which ranged from the Baltic to the Black Sea) or rather varied depending on the locale and specific Slavic tribe. Perun is undoubtedly the highest god of the Slavic Pantheon. Worshipped across wide expanses of Slavic Europe and even beyond (as Perkunas he also appears in Baltic mythology), Perun is the reigning lord of the heavens, and the god of lightning and thunder. As a thunder-god he has been compared to Zeus in Greek or Thor in Norse mythology. The name Perun itself goes back to the Proto-European root *per- or *perk-, meaning ‘to hit, or strike’ and can be translated as ‘He who strikes’. In fact, the name of this ancient god survives in the Polish language, where it came to denote ‘thunder’(piorun). While Perun was likely worshipped across the whole area of Slavic settlement, he is best attested for in Eastern Slavic sources. According to the early Ruthenian chronicles, Prince Vladimir the Great erected a cult statue of Perun (along with other Pagan idols) outside of his palace in Kiev shortly after he started his rule in 980. The statue of Perun was made of wood with a silver head and a golden moustache. As the greatest Slavic god, Perun was considered equal in power to the new Christian God. This however was no mitigating circumstance, as in 988 shortly after the Kiev Duchy adopted Christianity, the same ruler ordered that the pagan idols be destroyed. The greatest of them, Perun, was tied to a horse, dragged down a hill, and repeatedly beaten with sticks, before being eventually thrown into the Dnieper River. Vladimir then ordered that the statue be floated downstream until it passed the Dnieper Rapids. Only then should the soldiers leave it. The place where the idol washed ashore, as the chronicler adds, came to be known as Perunja Ren' (the Shallows of Perun). 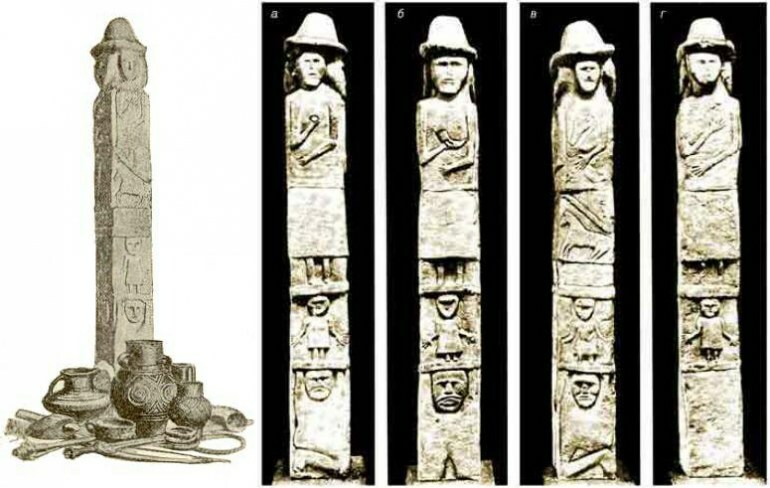 It is likely that the cult of Perun and the god himself took on different forms and names, depending on where it was worshipped across the vast expanses of Slavic Europe. This goes for a peculiar triad of gods worshipped on the island of Rugia (Slavic Rana, today Rügen off the German Baltic coast) which in Middle Ages was inhabited by the Slavic tribes of Rani (or Ruiani). The highest god of the island was called Ruievit (a name that can be translated as the Lord of Rugia). According to descriptions, the idol of Ruievit worshipped on the island had seven faces and seven swords fixed around his waist, with the eighth sword firmly placed in the god’s hand. The two other gods Porevit and Porenut also had multi-faced idols, typical of the Slavic religious cult. 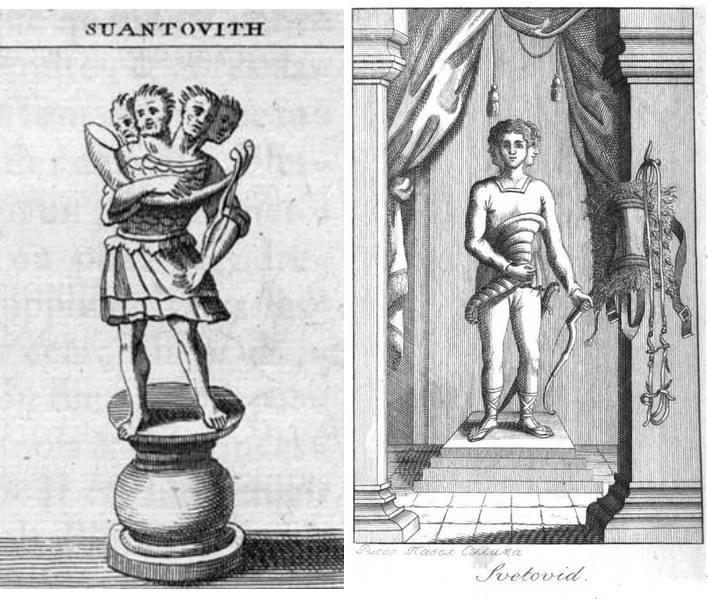 The statue of Porevit sported five heads and Porenut had four (with a fifth face carved into his chest). While the name of Porevit (reconstructed as ‘lord of force’) suggests that his domain was mostly that of the military power, the name of Porenut could point to another fact, namely that Porenut was the son of Perun (Pol. Piorunic). This in turn, as Aleksander Gieysztor suggests, could be an argument for a theory that Ruievit was just another name for Perun, namely the Perun ruling over the Rugia, with Porevit and Porenut acting as his twin sons. 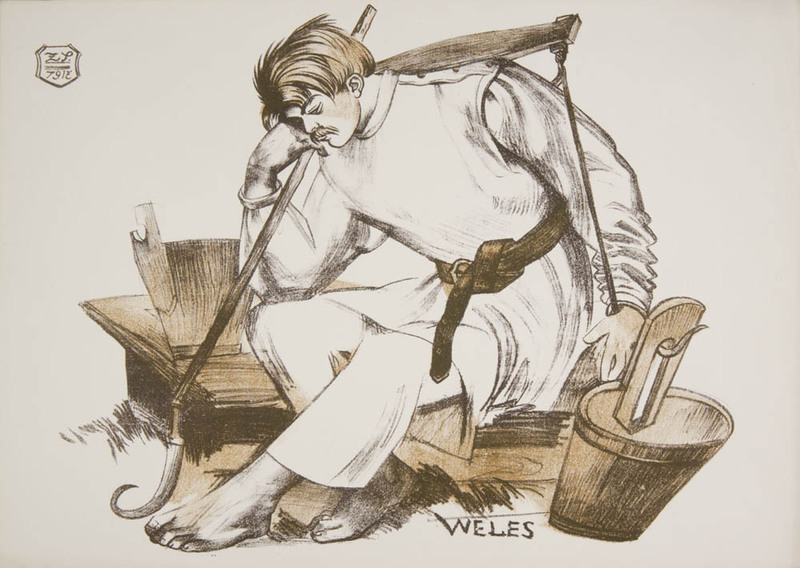 Veles (or Volos) is sometimes called the second most important god of Slavic religion. The old Ruthenian chronicle which calls him skotiy bog makes him the god of cattle. This would also position him as the god of wealth (as cattle was one of the main markers of a family’s wealth). Other hints suggest he could have been linked to such domains as magic, poetry, oaths, the underworld, and the dead. Veles is sometimes seen as the mythical antagonist of Perun, part of a structural pattern that may reflect a more ancient Indo-European myth of a primordial rivalry between the two opposing supreme deities (compare: Mitra and Varuna in Hindu mythology). Historians and ethnographers suspect that the relics of this ancient notion may have survived even centuries after Christianisation, and can be found in the Slavic Cosmogonic myth which transposes the same theme of rivalry between God and the Devil (See below: Slavic Creation Myth), the latter being a version of Veles. This identification can be observed in Czech folklore as late as the 16th century, where the phrase ‘Jdi za moře k Velesu’ (Go across the sea to Veles!) means ‘Go to the devil!’. Another god connected to oath-making and divination, Triglav is best attested for the Pomerania region (Baltic Coast). In fact, he may be only a local form of Veles. A three-headed statue of Triglav in Szczecin was described by Christian writers as covering its mouth and eyes with a golden encasement which was interpreted as the god’s refusal to witness people's sins. The three heads of the god stood for the three realms ruled by Triglav: the heavens, the Earth, and the underworld. Called also Svetovid and Svantovit, Sventovit may be the most famous of all multi-headed Slavic gods. He was worshipped in Arcona on the island of Rügen (Rugia), where a monumental statue of him stood in the central point of the temple. According to the Danish historian Saxo Grammaticus, the figure had four heads and four necks, and held a drinking horn in one hand. Saxo also mentions that the style of the idol’s moustache and hairdo as mimicking the local fashion. 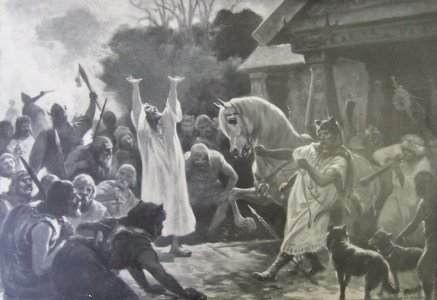 He also recounted numerous forms of war divination performed around the temple, often involving a white horse, a holy animal of Sventovit, which may suggest that the deity had similar functions to Veles and Triglav. Another god similar to Sventovit and a possible incarnation of the mighty Perun is Jarovit (Gerovit). Venerated in Wolgast (in Pomerania) and Havelberg (inhabited by the Polabian tribe of Brezani) he was compared by the Medieval Christian scribes to Mars, Roman god of war. The crowd of pagan followers watched as the armed invaders violated one taboo sphere after another. The fence around the shrine was taken apart, the curtains which enshrouded the statue were torn down, two men were ordered to chop down the legs of the sacred figure. Then a piece of rope was put around the god's neck, as he was dragged to the victorious camp, where the kitchen servants would chop him up for firewood. With a gigantic crash the idol tumbled to earth. The swaths of purple drapery which hung about the sanctuary certainly glittered, but were so rotten with decay that they could not survive being touched. The sanctum also contained the prodigious horns of wild animals, astonishing no less in themselves than in their ornamentation. A devil was seen departing from the innermost shrine in the guise of a black animal, until it disappeared abruptly from the gaze of bystanders. These were the last moments of Svantevit and the Slavic religion. 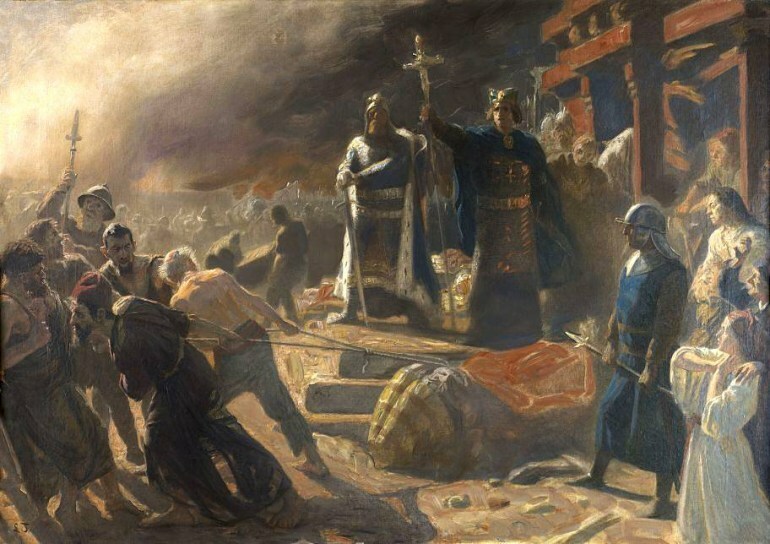 In the Eastern (Ukraine, Belarus, Russia) and Western (Poland, Czech) regions inhabited by the Slavs, the pagan cult had been extirpated even earlier following the conversion to Christianity in the 10th century. Stribog – god of wealth and winds. Mokosh – one of the few female goddesses in the Slavic pantheon, but her origins likely go back to the mythology of Finno-Ugric tribes. She was linked with the cult of the Great Mother. Svarog – god of the sun, celestial fire, and blacksmithing; sometimes identified with the Greek Hephaistos. The popularity of Svarog in Western Slavic lands is reflected in such geographic names as Swarzędz in Wielkopolska or Schwerin (Slav. Svazhin) in Mecklenburg-Vorpommern. Dažbog – son of Svarog (and hence also known as Svarožič), like his father also a solar deity, god of the sacred fire of the hearth. Hors – one of the deities worshipped in Vladimir’s Kiev before Christianity; possibly a lunar deity, Hors comes from Iranian mythology. Semargl – was a deity of vegetation, connected with good harvests; like Hors it must be derived from Iranian mythology, where a similar creature, a griffin with a dog's body, is known as Simurgh. Obviously, apart from the major gods, Slavic religion had a whole array of lesser deities, local gods, house spirits, and demons. The most important of those was likely Rod – a Slavic personification of fate. Rod was usually accompanied by Rozhanitsy – invisible female creatures who immediately after a child’s birth decide as to its destiny (similar to Roman Parcae or Greek Moirai; i.e. Fates). The name of both Rod and Rozhanitzy goes back to Slavic root meaning ‘birth’. A similar concept is Dola, a female deity or protective spirit which takes care of the household and sometimes nurses children. We know very little about the Slavic concepts of life after death. However, the diverse array of blood-thirsty demons, like upiers (Pol. upiór), vampires (wąpierz, wampierz), and strigoi (strzyga), which survived in Slavic folklore long after Christianization, could suggest a rather grim notion of the afterlife of the Slavic soul. Little is known of rituals and cult venues in Slavic religion. It seems likely that many ceremonies were performed in the open air, around natural venues, like holy trees (oaks, in particular, as linked to Perun), groves, river sources, hills, and stones. Christian writers also mention and sometimes carefully describe pagan temples, like the Sventovit temple in Arcona. 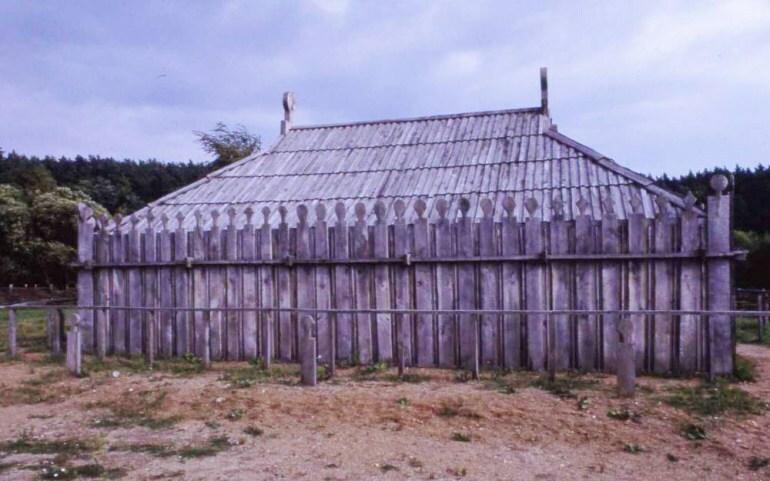 However these ‘pagan churches’ are attested primarily as late as 11th and 12th centuries and are limited to Polabia and Pomerania. This led some scholars to suspect that these structures may be rather a late Pagan reaction to the advance of Christianity and its architecture. According to Thietmar of Merseburg, Slavic gods liked the taste of human and animal blood. Another Medieval scribe depicts in detail the gory martyrdom in 1066 of a Mecklemburg bishop, John, whose head was sacrificed to the god Radegost. And human sacrifice was also attributed to Perun. While these are all late testimonies (and coming from Christian writers), many scholars consider human sacrifice as not an altogether improbable element of the Slavic religion. As analogies with other cultures show, human sacrifice could have been a functional element of early Indo-European religion, even in as late and as ‘civilized’ cultures as the Roman Republic (compare the human sacrifice ordered by Julius Caesar at the Campus Martialis in 46 BC). A more typical feature of Slavic religious ritual was horse divination. Horses (often white) appear in many records of Slavic ritual war divination. The horse’s behaviour was crucial in the community’s decision-making process regarding such decisions as going to war, waging a battle, etc. In the beginning there was nothing other than heaven and ocean, God in his boat, and a devil emerging from the sea foam. He sat next to the God. It was the Devil who suggested to God the idea of creating the world, as he couldn’t accomplish it himself. The Devil dived in and came back with a handful of sand taken from the bottom. God scattered it on water and created the beginnings of the Earth, which however was so small that they both hardly fit. God and Devil inhabited the Earth, when the Devil decided he would push the sleeping God off into the water. But all he did was to make the Earth grow from the God’s side, from the East, and from his side from the West. The two creators started an argument which ended with God withdrawing to the Heavens, and the Devil being precipitated into the abyss by God’s thunderbolts. The Iranian roots of Slavic religion? As Aleksander Gieysztor, one of the most accomplished scholars of Slavic religion, observed, this cosmogonic myth weaves together two motifs typical of Indo-European mythology: one is the oceanic origin of all Being, from which all life originates, the other is the dualistic aspect of creation, a result of the collaboration of the two otherwise antagonistic mythical figures. These figures in the story told to ethnographers by a 19th-century Polish peasant are represented by God and the Devil, but as Gieysztor suggests, they maybe only names behind which much more ancient deities hide, like, why not, Perun and Veles (compare the thunderbolts). The radically dualistic aspect of this myth, known best from Iranian mythology (compare Ahur Mazda and Ariman) is further explained by the long-time close relations which connected Slavs and Iranian tribes (like the Sarmatians) living in the northern Black Sea area. In fact, as Gieysztor proves, much of the most essential Slavic religious vocabulary owes to these close neighbourly ties, including the words for heavens (Slavic nebo, Iranian nabah) or god (Slavic bog vs Iranian baga). Which is yet another fascinating chapter in the little known history of Slavic religion. Piotr Węcowski, Perun i inni [aricle] in: "Polityka: 966 Narodziny Polski - Pomocnik Historyczny".